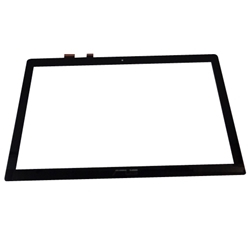 Description: New Asus laptop replacement black digitizer touch screen glass. This is not the actual screen. This is the glass on top of the screen that reacts to touch. This item is the glass only and does not include the plastic bezel. Asus N550J, N550JV, Q550L, Q550LF.